Its official. 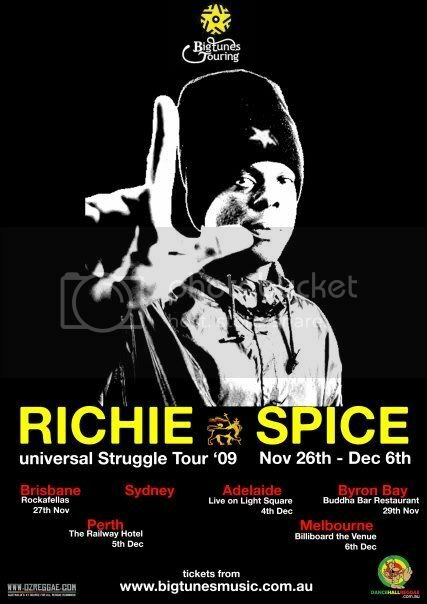 Richie Spice will be headlining the first “Universal Struggle” Tour of Australia starting this November. Hailing from a musical family that includes his older brother Pliers (from the deejay/singer duo Chaka Demus and Pliers of “Murder She Wrote” fame), singer Spanner Banner and deejay Snatcher Dogg, and armed with just a microphone, one-drop rhythms and purifying lyrical flames, singer Richie Spice is the Gideon of contemporary reggae. The publicly declared “prince of fire” chanting culturally uplifting, spiritually fortified words to defeat the negative content that informs much of popular Jamaican music has been a revelation to all music fans. Currently, one of reggae’s most in demand talents and the recipient of numerous awards and accolades. He received the Most Cultural Artist Award at the 13th annual South Florida Reggae Soca Awards in 2005; voted the Male Singer/Singjay of the Year at Jamaica’s IRIE FM Awards in 2007 and following his performance at the first annual “Black My Story” concert held in Kingston on Feb. 2, 2008 Spice was honored for his positive musical contributions. His 2004 album “Spice in Your Life” was listed among the year’s best reggae releases by the New York Times; “In the Streets To Africa”, released in 2007, reached number 6 on the Billboard Reggae chart and one of the album’s biggest hits “Youth Dem Cold” peaked at number 59 on the Billboard Top 100 Singles Chart and ranked at number 29 on Vibe Magazine’s Best 44 songs of 2007. Ever since universal hit “Youths Are So Cold,” propelled Spice into mainstream airplay back in 2006, Billboard Magazine ranking him among the top six performers at Reggae Sunsplash 2006 and a succession of hits that have resided in the upper tiers of the reggae charts, Spice is back again, busy touring countries around the world after the release of his recent album, Gideon Boot (VP), in May 2008. The album peaked at number one on Billboard’s Top Reggae Albums, and spurned the culture hit, “The Plane Land,” which took Spice all the way to headlining reggae night at Reggae Sumfest last summer in Montego Bay, Jamaica. Now with the release of “Gideon Boot” even greater recognition is assured for Spice’s talent, as is the expansion of his international fan base. Fittingly, “Gideon Boot” is the title track of Spice’s brilliant fourth album. Recorded over the timeless “Johnny Too Bad” rhythm (taken from The Slickers 1970s hit of the same name, popularized in the film “The Harder They Come”) the song details Spice’s strategic plan for delivering his musical sermon to an awaiting global audience. Just like the singer’s previous albums “Universal”, “Spice In Your Life” (The New York Times named it one of the best releases of 2004, Los Angeles Times broadened the accolades, citing it as one of the year’s ten best albums of any musical genre and in Jamaica, The Observer newspaper honored Spice as artist and vocalist of the year) and “In The Streets to Africa”, “Gideon Boot” contains inspiring messages specifically aimed at empowering vulnerable youth. Spice confidently juxtaposes his songs of valor with unity themes (“Living In Love”, “Getting Harder”) and the importance of staying focused (“Make Up Your Mind”, “Hang On In There”). Spice’s flawless vocals effortlessly scale the high notes then smoothly segue into scatted improvisations as he weaves intricate, evocative melodies throughout this exquisite 15-track set that is certain to carry his name to unchartered territories for Jamaican music. Spice’s career has continued to soar as a result of his enthralling live performances and Australia will for the first time have the rare opportunity, of witnessing and celebrating this amazing reggae superstar. Performing in Sydney, Brisbane, Byron Bay, Adelaide, Perth and Melbourne, strictly one show in each city and staged in limited capacity venues. November 26th – December 6th 09. “My responsibility is to use the talent that God gave me as an instrument to uplift people who are facing the struggle worldwide and let them feel happy in themselves,” Spice explains. “It is all about righteousness, and endorsing the love of the people, good over evil and life over death. Local support info out shortly. Street Life, its the only life I know!!!! why do you comment on the price Grave? seems very reasonable to me. doesnt take a genius to know what sort of costs are associated with bringing someone like richie spice out. my point being is that if the price was lowered, more people would be happy to go out of there way to go to gigs like this, and it would attract a different, more humble, YOUNGER (sydney needs more young people coming out to reggae if reggae is to grow in sydney town) crowd. can i whinge about the venue as well? $40 to see an international artist is pretty bloody cheap when you compare it to other scenes and what they charge for just a run-of-the-mill interstate guest! I think $40 is very reasonable to see a touring artist. A steal actually! Yes Taylors is very strange indeed for the Spice show!!! Jesse and Damajah that's where we played together when Chantdown come up last time. Where's his backstage gonna be? $40 is reasonable, Mr Grave is all about free parties!!! not a tight arse. im happy to pay that price. im just saying theres plenty of people that wouldnt!! be good to draw more dnb/dubstep heads to reggae other than sunday dub club or foreign dub reggae gigs hence lowering the cost, better venue etc etc etc. Note the d'n'b/dubstep/jungle heads (as I observed in over a decade) DO NOT come to reggae gigs. Maybe a handful but nothing of note. As far as supporting artists from Ja. this crew never attend with any visible presence. Sunday Dub Club is not a reggae jam per se. It's a "dub" gig. Which means a lot of stuff. Nas playing Brisbane tonight for $90 a ticket. U going to Nas Chillin?? Cormega is the best!